Bird – RSBP, Fen Drayton Lakes, Cambridgeshire. A Land and Water Intervention during my ‘landart research project’, with support from Arts Council England, to develop new processes for making large scale images. 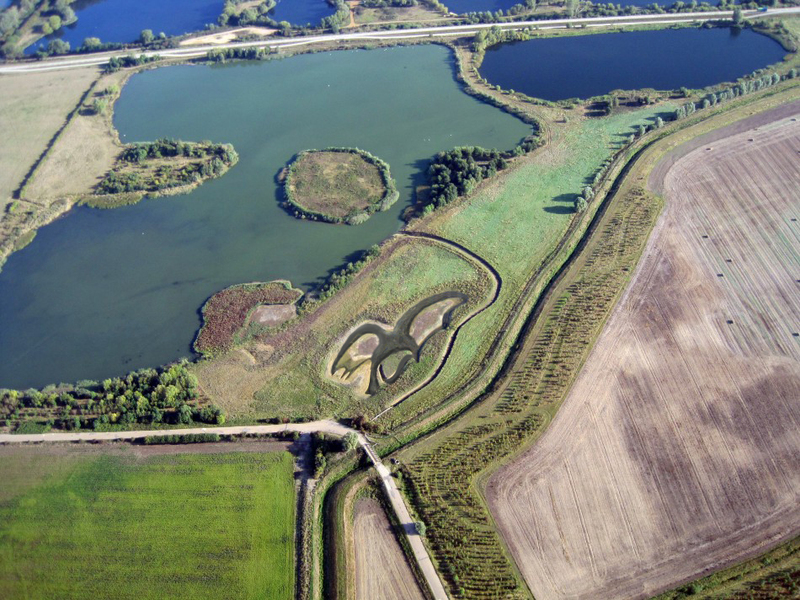 Originally intended as a series of linear scrapes to extend water from a lake, fed by the Great Ouse river. My proposal to develop this site as an artwork was supported by RSPB as a way to increase their visitor levels to the reserve by attracting new audiences. I used GPS to plot and create a waterscape depicting a bird in flight. The drawing’s edges have since been eroded by drinking cattle, and are seasonally overgrown by reeds. It is sometimes completely submerged and disappears and occasionally is barely full of water. The ditch system has become a home for dozens of bird species including waders and swans. It has two islands which provide a fox free place for nesting. In winter when the water freezes and snow falls, the bird appears brilliant white long after the land has thawed. how to get there. . .
February 12, 2013 | Filed under Commissions, Drawings, Landscape, Uncategorized and tagged with bird, cambridge busway, commission, drawing, landscape.